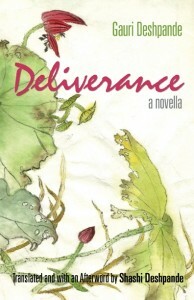 Deepa Deosthalee, in her blog Book Impressions, reviews Deliverance, and comments on A Pack of Lies. “… Whether it was motherhood, womanhood, marriage, relationships or life itself, Gauri Deshpande had the ability to be brutally honest, much to the chagrin of the male establishment of the time. In this, her most autobiographical story, she examines her difficult relationship with her daughters, not sparing herself or them and in the process, filtering her own experiences into evocative literature — the hallmark of many a great woman writer. This entry was posted on Saturday, February 18th, 2012 at 1:34 pm	and is filed under Deliverance, Gauri Deshpande, Pack of Lies, Review. You can follow any responses to this entry through the RSS 2.0 feed. Both comments and pings are currently closed.